I have no idea why I put these needles into my technology storage zone, and I had completely forgotten I'd bought them in the first place. But once I saw them I remembered why I did - it was for the cards. 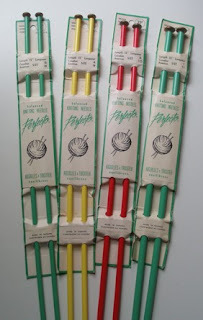 This is my favourite type of knitting needle, and the kind I learned on because my mother had a few sets and loaned one to me when I started my first sweater. They're not made any more anywhere, and when they were, in the 1950s or so, I assumed they were made in Canada or possibly the UK. They're sized to the now-archaic UK/Canadian system, in any case. Oddly enough, my mother wouldn't give me any of hers, so I had to go hunting on eBay. And then I kept getting outbid. Finally I got fed up and put up some ridiculously high amount, which won me a huge lot of mixed sizes; the seller was so horrified at the price she wouldn't let me pay for shipping. Now I can match the needle colour to the yarn for any given project, which is very handy when you want a good contrast between stitch and stick. Canadian and American sizes given on the card though not on the top of the needle! French and English both printed right onto the card, implying that these were made only in Canada and not in the UK at all! Priced at 39-49 cents a pair! ...I slipped them into a plastic bag and stuffed them into the technology zone. Sure, it's tempting to say I am absent-minded and disorganized, but isn't it nicer to think that I wanted to give myself a nice surprise some day, a gift from the younger me to the older one?